Did you enjoy our brief romp with winter? Houston smashed some records with a low temperature of 35 degrees on Sunday at Bush Intercontinental Airport (breaking a mark of 39 degrees), and a low of 39 degrees at Hobby Airport (breaking a mark of 42 degrees). Perhaps hell is freezing over because the Houston Astros are about to win the World Series? Anyway, this cold spell offered a taste of winter, but after another pleasant day Monday we’re going to settle back into a warmer pattern for awhile. Southerly winds have already returned, and while this morning saw clear and cool conditions in the low 50s, we’ll warm quickly into the upper 70s under mostly sunny skies. Tuesday will offer mostly treats in terms of weather—but potentially a few tricks as well. We’re going to see a weak cool front move into the Houston area and then essentially stall at or near the coast. Effectively, this means we are going to see some increasing rain chances later on Tuesday, especially to the west and southwest of the Houston metro area. While some light rain is possible in Houston during the afternoon and evening hours, I’m hopeful that some or most of the region will remain dry. However, rain chances will improve significantly during the overnight hours. Temperatures during trick-or-treating will likely be in the upper 60s to lower 70 degrees. We’re pretty confident that as the front (which stalled Tuesday) moves back inland, followed by warm, moist air, that rain conditions will be favorable on Wednesday. 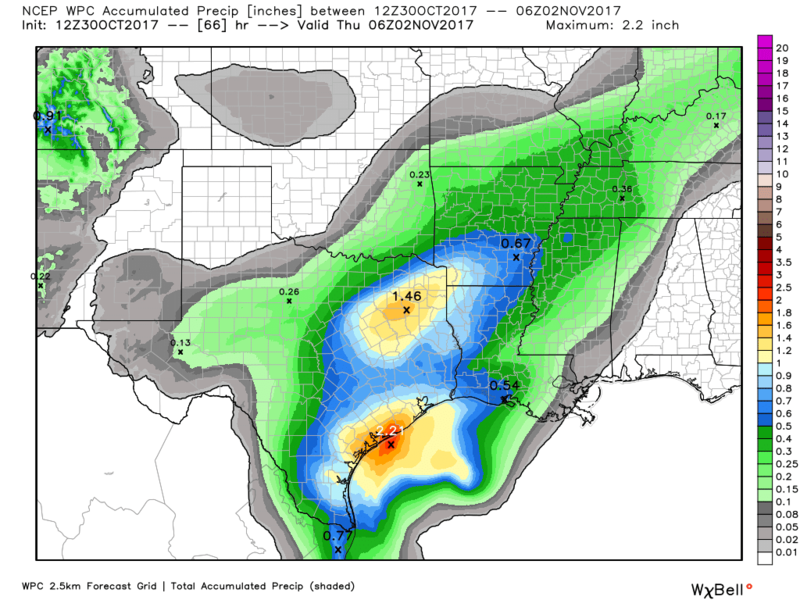 Given these conditions, I expect most of the area to see 0.5 to 2.0 inches of rain, which the higher amounts more likely south of Houston. Most of the rain should end by the afternoon, as the system moves off to the east, allowing highs to reach about 80 degrees. Welcome back warmth. 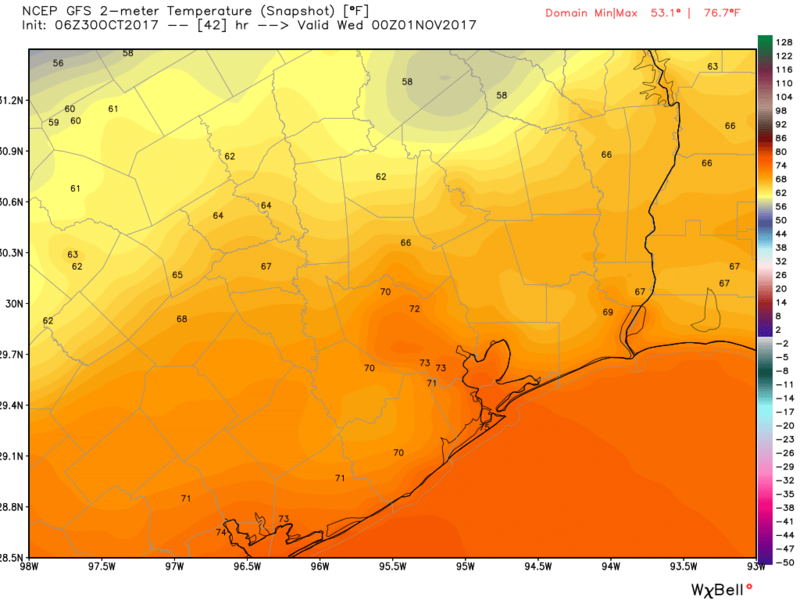 In the absence of any front, more warm and humid conditions are going to settle into the Houston area through the weekend. I expect we’ll see partly to mostly sunny days, with highs in the mid-80s, and overnight lows in the upper 60s for inland areas, and lower 70s near the coast. It won’t be oppressive, but temperatures will be a good 5 to 10 degrees above normal for early November. It looks like our next real cold front probably won’t push through until Tuesday or Wednesday of next week, so if you like the cold, hold tightly to this morning as long as you can. Little glitch in the caption to that first diagram: “But what of the our rain chances?” Needs to lose one of “the” or “our”. What are the next 2 1/2 dry days do you recommend that I let my roofer replace the shingles on my tornado damaged roof? I live in Sienna Plantation. This time of year this is what I tune in to weather forecasts for. Should severe weather and serious street flooding be anticipated Wed.?